A 22-year-old runner who was taken ill after completing the London Marathon has died, race organisers have said. They said the man died in hospital and offered their "deepest sympathy and condolences" to his family and friends. A second runner who was in a critical condition overnight has now stabilised but is still in hospital. The cause of the 22-year-old's death has not yet been released - his is the ninth death since the London Marathon began in 1981. St John Ambulance said of the 5,032 people it treated, 73 went to hospital as runners battled 21C temperatures at midday, equalling the 1996 record. The St John Ambulance first aid charity provided some 1,400 volunteers, 50 ambulances and 59 treatment centres for the race. London Ambulance Service said this year's event, which attracted a record 36,391 runners, was "busier" than usual, with participants and spectators affected by the heat. 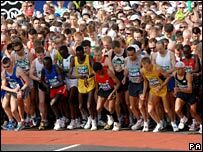 London Marathon chief executive Nick Bitel said that more than 100 doctors were out on the course, including some of the world's leading medical experts. Organisers installed four run-through showers along the route and added an extra 2,600 bottles of water to the normal stock of 25,000 bottles at each station to help runners deal with the high temperatures. Mr Bitel said: "We put out so much water on the course. It's enough water for over 7.5 litres per runner. That's far too much to drink in fact. The message was don't take water at every water station. Drink sensibly when you need to, not just because there's water there." Responding to comments that some runners were left without water due to supplies running out, he said: "We do certainly run out of water on some water stations every year. But we make sure we have enough water so runners can get around safely. That was certainly the case yesterday. "Some water stations were running short and ran short, but the combination of the extra water we put out because of the water conditions in advance and on the day, and the combination thanks to the London Fire Brigade for the extra showers on the course meant that so many people were able to safely complete this race." Celebrity chef Gordon Ramsay, who was running his eighth marathon, said the conditions were "extraordinary". He said: "It was like running in a desert today. I stopped to help one guy. It was quite bad. They were dropping like flies." Champion athlete Liz McColgan, who won the marathon in 1996, said some runners were in trouble. She said: "I saw a lot of people walking with cramps and things. I think a lot were suffering."